/ How Much Water Should I Drink When Pregnant? Congratulations! You're going to be a mom! It's going to be a long journey. It's understandable to have doubts and be worried at what lies ahead of you for the next nine months. However, don't fear as water is one of your constant allies to make sure your pregnancy is healthy. You're likely saying no way. More so, you're wondering how can water have such an effect on you and your pregnancy. Well, to begin with, water is critical to the body's overall health. You should know the average adult female's body composition consists of 55% water. So, you should consume 2.7 liters or the equivalent of about eleven and a half glasses of water daily. However, when you're pregnant, the daily water requirement increases. 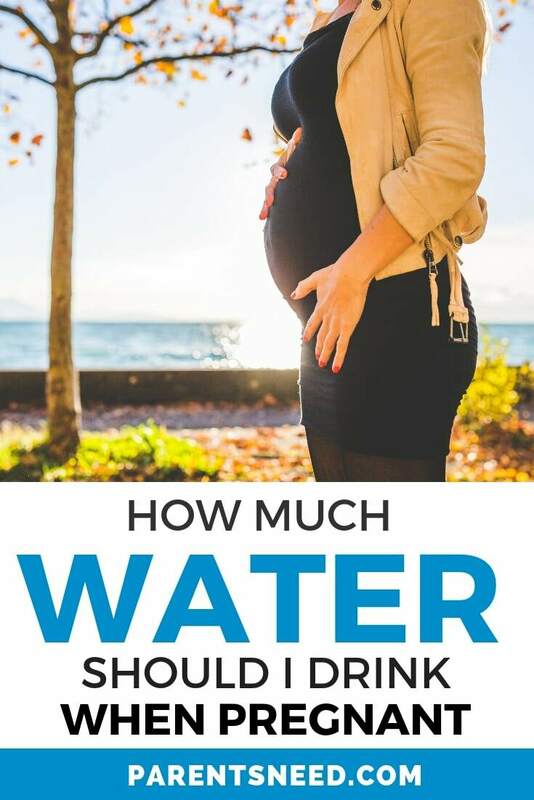 If you're curious about how much water should a pregnant woman drink a day, well, it goes up to 12 ½ cups or the equivalent of 3 liters or 101 ounces of water. Remember, this is only the minimum requirement. The actual amount changes depending on your personal needs. All the same, drinking water during pregnancy is critical as it benefits the mom's health and the baby's. Your body goes through a lot when you're pregnant. Hormonal changes come into play, and you experience sensory overload. It's because your body undergoes many physical changes during your pregnancy in preparation for childbirth and breastfeeding, Healthline explains. Likewise, the body of a pregnant woman also has greater requirements for blood and oxygen. What hormonal changes can you expect? To start with, you'll experience an increase in estrogen and progesterone. Both hormones play key roles in your reproductive system. However, when you're pregnant, they tend to go into overdrive. For instance, Babycenter.com explains increased progesterone can cause constipation. Your digestive tract slows down as your body's muscles become relaxed and this causes your digestive tract to slow down too. Drinking water can give you relief from constipation. Isn't that a wonderful feeling! Hormonal changes can also make you gain weight during pregnancy. When combined with gravity, it can weaken circulation and cause swelling in your lower limbs. Believe it or not, the remedy for swelling is water. Chances are you're worried drinking more will worsen your swollen ankles. But as WhattoExpect points out, water can prevent it. How? Water flushes out fluids and the excess sodium in your system to lessen the chances of it happening. How are your senses affected during pregnancy? Your sense of taste might decrease during your first trimester. It's known as dysgeusia, and it's what gives you a metallic taste in the mouth. This condition can worsen nausea or morning sickness, which is one of the top pregnancy fears among pregnant women. In fact, many worry morning sickness is keeping nutrients away from their baby. If you suffer from this, then follow one of the pregnancy tips from Womhealth.org and squeeze a bit of lemon juice into your water. WhattoExpect explains sour flavors, including vinegar, can curb the metallic taste. Likewise, it can help boost the production of saliva to help wash out the bad taste. However, be sure your stomach can handle the sourness. If not, then Huggies suggests sucking on ice chips or taking sips of plain ice-cold water. What skin conditions appear during pregnancy? Prurigo or itchy skin is common during pregnancy and typically affects your hands and feet. According to American Pregnancy, it’s the result of bile buildup in the body while you're pregnant. Drinking water can help ease the added discomfort of itchy skin that you may be feeling as it helps clean the lever of excess bile. ICPCare suggests drinking a warm cup of water with the juice of half or a whole lemon for detoxification. Prurigo tends to occur during the third trimester. But, rest assured it will go away once you give birth. What are the circulatory problems you'll encounter? First-time moms are at risk of experiencing high blood pressure. It's due to changes in their circulatory system during pregnancy. You should know high blood pressure is one of the symptoms of preeclampsia. Your risk goes up if you're overweight or pregnant with multiple babies. Your age when you're pregnant is another factor to consider. Preeclampsia can lead to liver failure or cardiovascular issues in your future. It can also affect your baby by preventing the flow of blood to the placenta. If this happens, then your child won't get enough food and oxygen. If this is making you scared, you don't have to be. Just remember your doctor's advice and take your eight glasses of water daily. Dizziness is also common and occurs after your 24th week. According to thebump, the dizzy feeling you get is brought on by blood pressure changes. Dehydration is another reason for it. Drinking water can ease the dizziness. Likewise, lying on your left side also helps. What Respiratory Problems Affect You During Pregnancy? Hyperthermia or overheating can affect you while you're pregnant. A pregnant woman's body core temperature goes up due to increased blood flow. A woman's average core temperature when she isn't pregnant is at 37 degrees C. When you're pregnant it rises to 37.8 degrees C. Drinking water can help regulate your body temperature. Trust me. You'll be thankful for drinking lots of water when you happen to be pregnant during the summer months. Remember, dehydration can happen to you at any time during your pregnancy. So, you should be aware of how it can affect a mom's health. Moreover, it can bring about mild to serious problems. Morning sickness is common during the first trimester, and this can cause nausea. It's the reason why many pregnant women don't feel like drinking MomJunction points out. But if you feel this way often, then you're at risk of Hyperemesis gravidarum. When this happens, you might have to go to the hospital for Intravenous (IV) fluids. The threat of a urinary tract infection (UTI) can occur between your 6th and 24th week of pregnancy. The added weight of the uterus on your bladder can hamper the flow of urine and cause UTI according to American Pregnancy. UTI can cause a lot of pain. If left untreated, it may infect the kidney and in turn, induce early labor. It can even cause low birth weight. Amniotic fluid is essential to your baby's health while inside your womb. Body fluids from the mother supply the water to the sac. Fetal urine only takes over by the 20th week. If the fluid isn't enough, then the baby at risk of being born with a deformity. Low amniotic fluid can also result in neural tube defects affecting the baby's spine or spinal cord. It can also affect the brain. Drinking water during the third trimester provides you with the necessary mom support you need in preparation for labor. Likewise, it can minimize the occurrence of diarrhea during this time. BabyPrepping points out preterm labor can occur if your body doesn't have sufficient water. Hence, it poses a significant threat to you and your baby. Your water intake during pregnancy can help promote lactation. It's beneficial when the baby arrives that your body has enough supply of breast milk for feeding. Remember, you need to keep up your water intake to be able to nurse your baby. The easiest way is to have a water bottle handy with you wherever you go. Case Western Reserve University Hospitals advise nursing moms to take 3 quarts of fluid daily. Despite the overwhelming proof of how water can help your pregnancy, chances are it's already making you sick. You're not alone. A lot of pregnant women feel this way. In fact, they've expressed their concerns on numerous online forums where you can get mom support. For some, the problem can occur early in their pregnancy then nausea disappears after a few weeks. However, others aren't so lucky as their aversion to water can occur up until the third trimester. If this is you, then it's possible you have a hard time keeping down your water. Are you tired of drinking plain water all the time or you simply can't keep it down? Here's what you can do to get your daily water fix even while traveling pregnancy. It's not easy to drink a lot of water every day. Even so, it's necessary if you want to secure your health and your baby's. EverydayFamily advises keeping this thought in mind when you start to feel overwhelmed by the amount you need to drink. You can try to stay hydrated by drinking fluids other than water. However, you should be cautious with your choices. Remember, the last thing you want is to have more sugar in your diet just for the sake of flavor. Dietitian Sasha Watkins from BabyCentre suggests drinking flavored water instead. All you need is a wedge of lemon or mint leaves added to a glass of plain water. It's also good for taming morning sickness. Additional pregnancy tips from Watkins suggest taking ginger drinks to minimize your nausea. Milk is a good substitute for water. Moreover, it's beneficial to you and the baby. It provides you with vitamin B5, calcium, and iodine. You can also try adding fruits to your glass of milk to create a smoothie. If you want something less sweet, then try a vegetable-based smoothie instead. Certain foods can also add to your fluid intake and gives variety to your diet as well. Soups, yogurt, and salads are best for this purpose. If traveling pregnancy is necessary, then you'll need to pack a few extra items. Prepare and fill a water bottle because chances are you'll get thirsty. It's also advisable to bring fresh juice and several healthy snacks. Remember, just because you're on vacation it doesn't give you an excuse to give into the temptation of reaching for a sugary or caffeinated drink. It's not enough to know what fluids you can substitute for water. It's also important to know what fluids you shouldn't drink. By doing so, you can prevent any bad surprises from harming you and your baby. Remember, just because it's healthy, it doesn't mean it's pregnancy-friendly, according to The Health Site. A case in point is green tea and wheatgrass juice. Both drinks offer several benefits. However, these are not advisable for pregnant women. Green tea contains caffeine. When taken in large amounts, it can hinder the absorption of folic acid. Remember, folic acid is essential to your pregnancy during the first 12 weeks, according to BabyCenter. Wheatgrass Juice: This is rich in nutrients. However, the Mayo Clinic advises against taking it during pregnancy, moreover, while you're breastfeeding. Since it is consumed raw and because of how it's grown, then the chances of mold and bacteria are higher. Thus, it could harm your unborn baby. Fizzy drinks are also not good for you while you're pregnant regardless if it's low or even sugar-free. Chances are these contain caffeine. A typical can of cola can contain 40mg of caffeine according to the NHS. The Daily Meal advises against drinking apple cider, in particular, those bought from a local farmer's market. Chances are these are unpasteurized. Hence, it poses a grave risk of bacterial growth. While it might sound healthy and safe, freshly-squeezed juices sold at juice bars might not be right for you. In fact, the U.S. Food & Drug Administration tells consumers to read the labels to make sure the drink is pasteurized. It's important for pregnant women as the risk of acquiring a food-borne illness is possible if you drink something unpasteurized. Still wondering how much water to drink while pregnant per day? Well, more never do you any harm! These pregnancy tips offer practical advice for pregnant women like you. It explains the critical role played by water in securing the mom's health. At the same time, how water also affects the well-being of the baby in your womb. Your body undergoes a lot of changes throughout the 40 weeks of pregnancy. If you're unprepared, then it can lead to confusion. The uncertainty you'll feel can make you anxious and take away the joy of pregnancy you should be experiencing. Arming yourself with knowledge can prepare you and minimize uncertainty. Likewise, ease your fears. In doing so, you gain the confidence needed to make the right choices for you and your unborn baby.